Re: Boats sure are alot of work!!! Dont you guys get prescribed aluplurinol to get the blood over acidity back to normal, which stops the gout in its tracks...? Indomethacin. It works, but usually takes a day or two and is pretty hard on the guts. 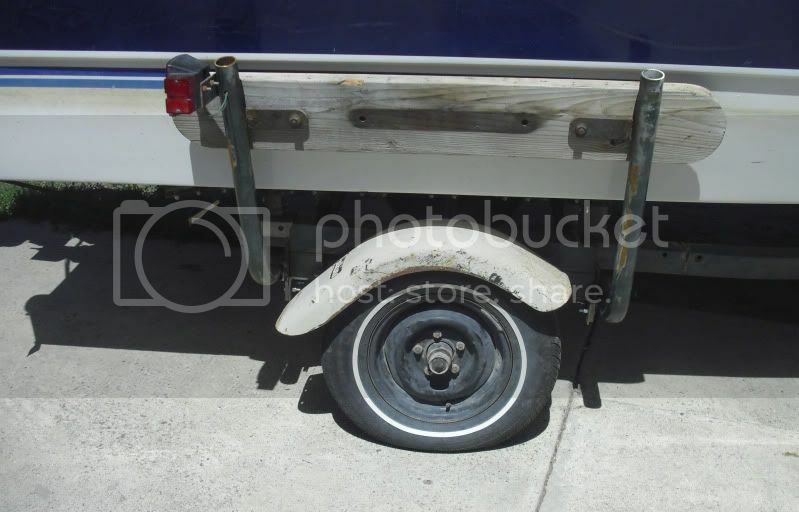 We have also been over hauling my boat trailer. The rollers on the easy roll system never have worked very good and they were getting so old that one broke and fell off. So I decided to make some bunks to replace them. I was busy and didn't take any pictures while we were working on this one. But here is what we did. It was all done with stuff we took off or scraps that I've collected. The only thing I bought were the bolts. The boat was too close to the Blazer. So we moved it back about 5" on the trailer. I loosened the axle trunnion and slid it back 2". 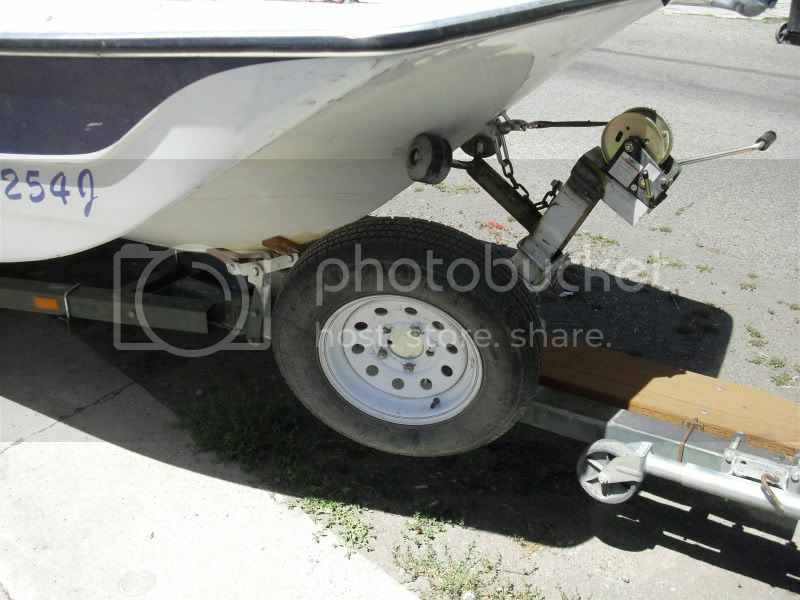 I moved the yellow bow stop down low and it now centers the boat on the trailer. 2 of the old rollers were in OK shape so I made a new Bow stop out of them. 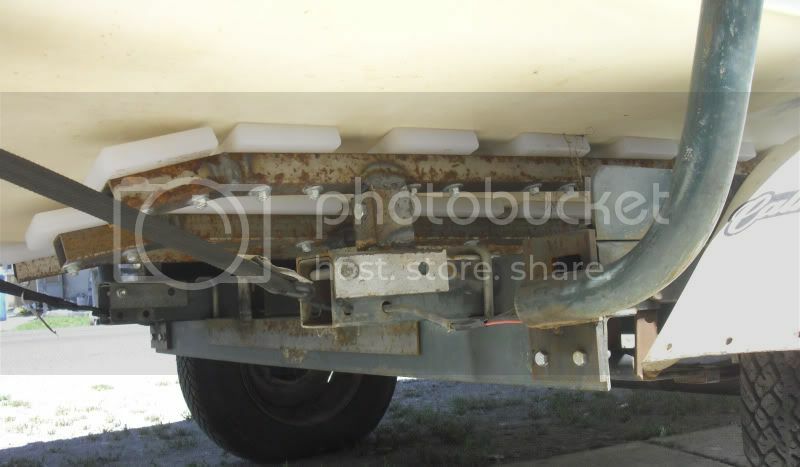 I moved the jack to the other side and made some brackets to hold a plank next to the tung of the trailer. I can now walk on the trailer very easily with out loosing my balance. 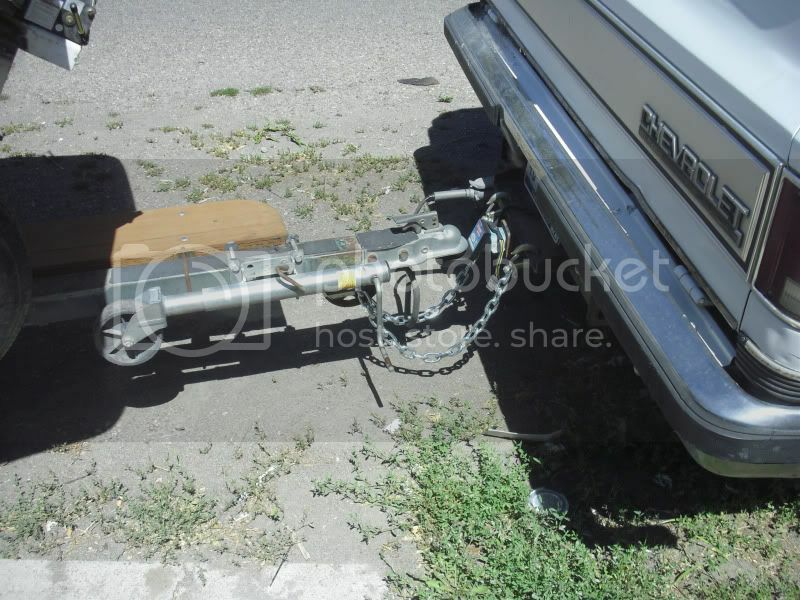 We also repositioned the bracket for the spare tire. We then pulled all the rollers out from under the boat. A friend had given me some plastic and I made the new bunk boards out of it. This would have been easier if I had a way to take the boat off the trailer while we were working on it. We also lowered the boat about 3" on the trailer. I have never been happy with the safety chains that were on it. So I installed some new ones. When we lowered the boat it was way too close to the fenders. We made new mounts that mount to the axle, so they now float with the wheel. We used the hoops that the rollers were mounted to to make new more sturdier side boards. We then mounted the lights up high on them. My uncle offered to help me paint it. At his house we can take the boat off to do that.